A unique, hand painted, panelled cupboard, fashioned with two handy top drawers. 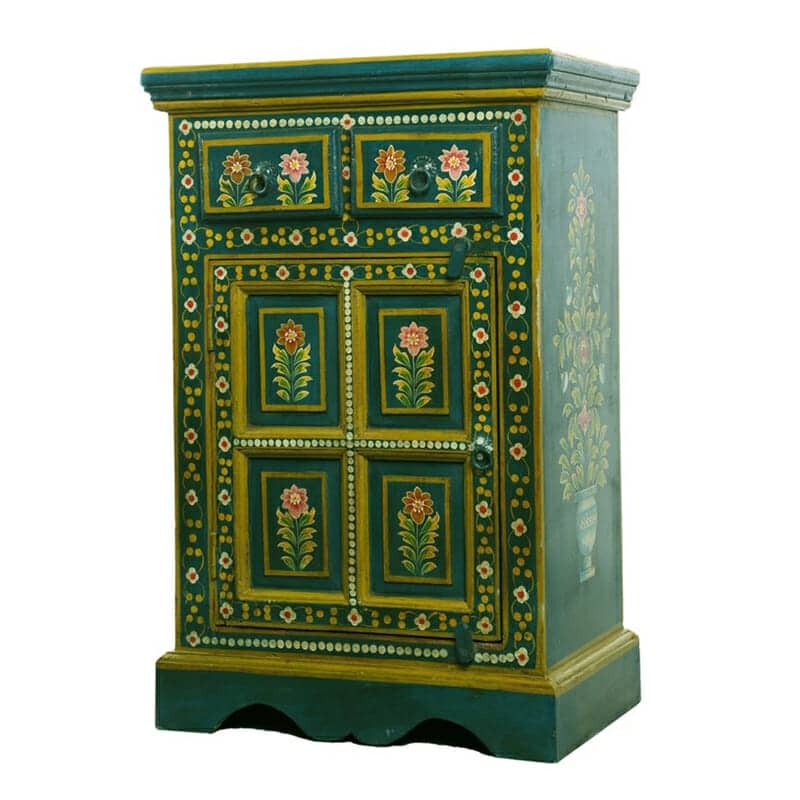 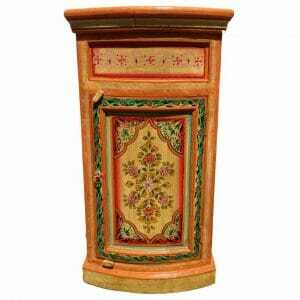 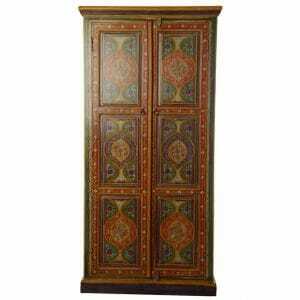 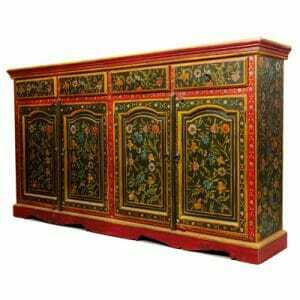 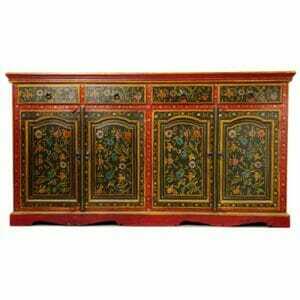 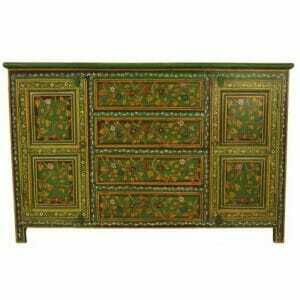 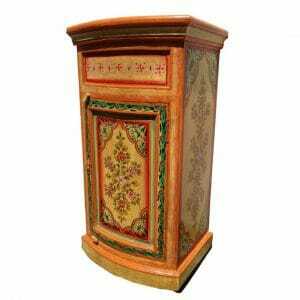 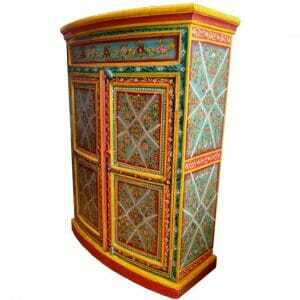 With similarities to northern European traditional folk art designs, the painted cabinet displays some of India’s finest decorative art furniture. 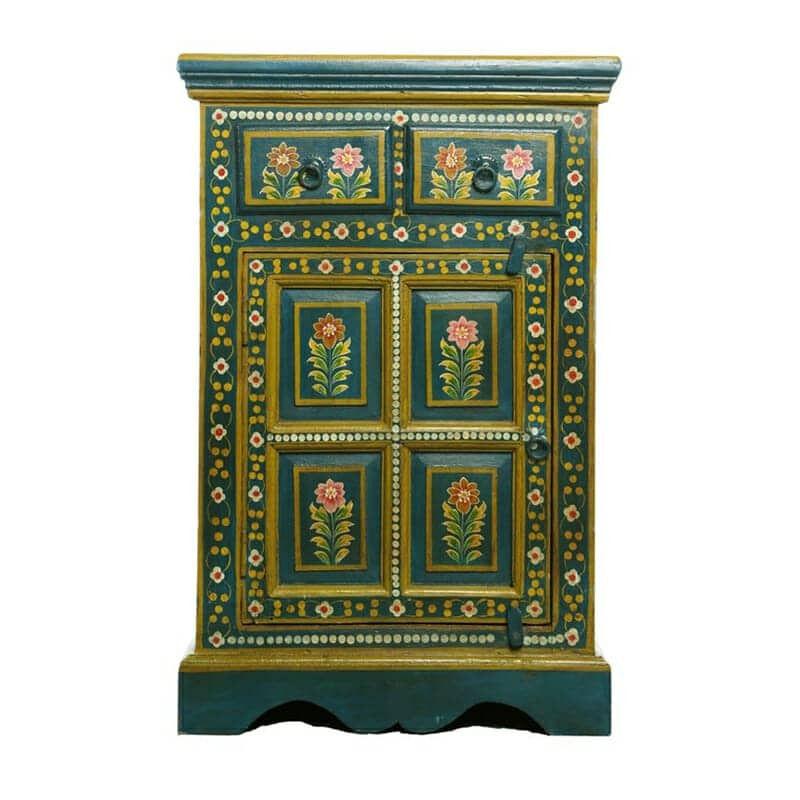 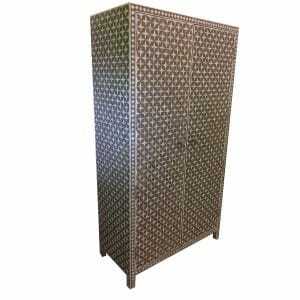 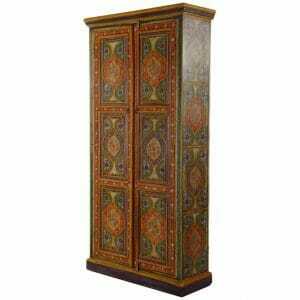 Bold contrasting images, in repeating, symmetrical patterns, give a heart-warming feel to this original Indian cupboard. 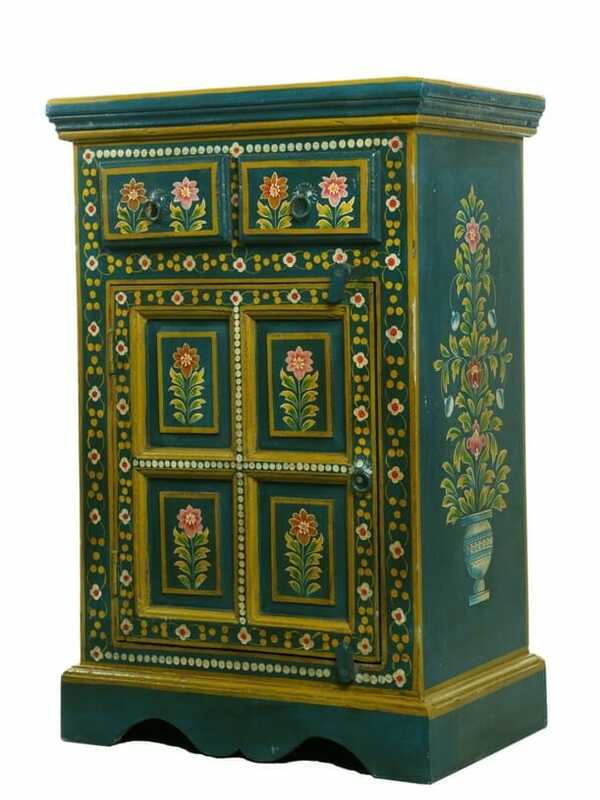 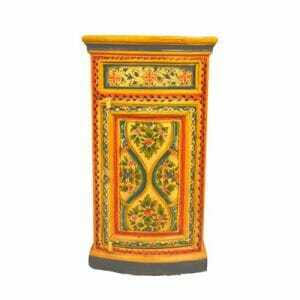 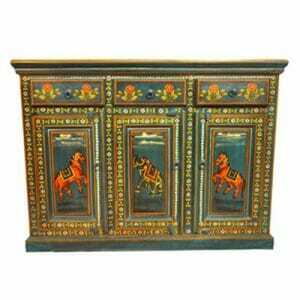 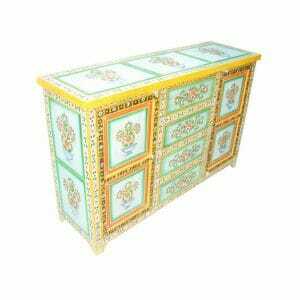 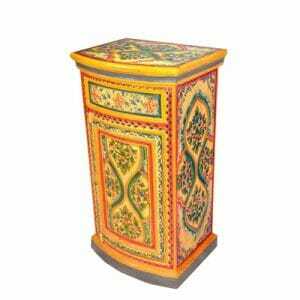 Hand crafted and hand painted in the studios of Rajasthan, the Indian bedside cupboard brings the feel of the orient into any room and looks just as good in a living room flanking a sofa as it does filling a hallway nook. 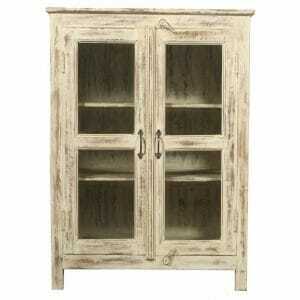 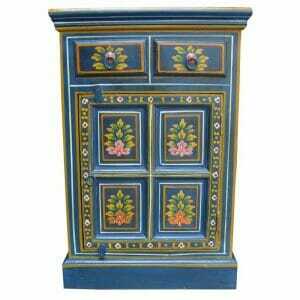 The painted cupboard looks particularly good against a grey background, which sets off its colours. 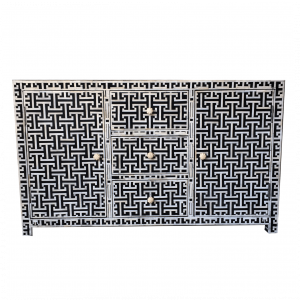 With two small useful drawers for housing those runaway items, keep surfaces clear and keys easy to find with neat, organised space. 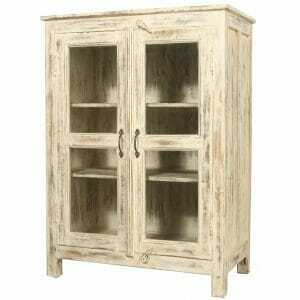 The single internal shelf is structured for strength and can hold heavy items. 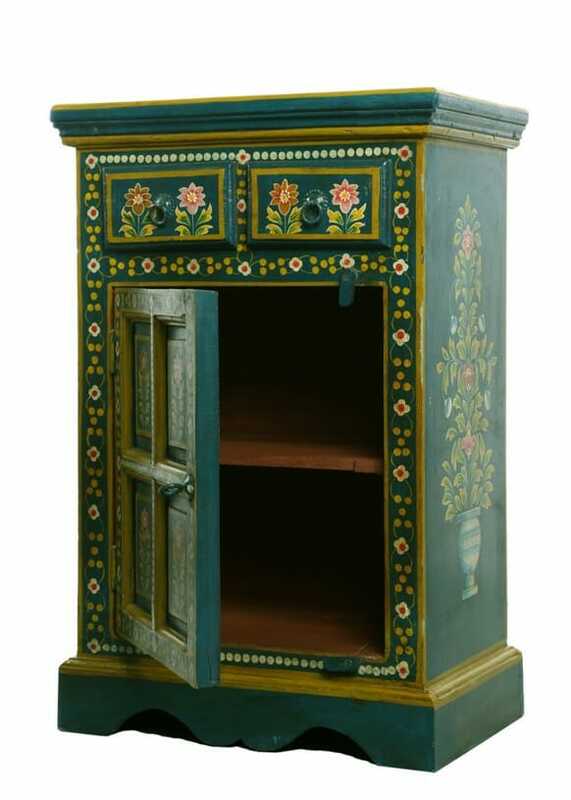 The painted wood furniture is skilfully assembled by highly trained master craftsmen, who combine their knowledge of handicrafts with their creative inspiration, integrating traditional carpentry methods with modern international innovations, resulting in artistic, ornamental furniture with sturdy, strong woodworking joints and solid carpentry in resilient hard wood; something to hand down through the generations. The sheesham and mango wood used in all our Indian furniture is sustainably harvested and favoured by Indian furniture enthusiasts for its durability, longevity and resistance to environmental stresses. 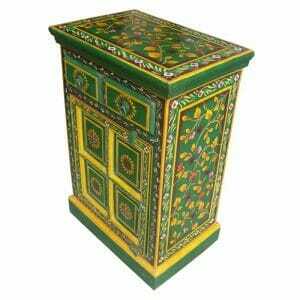 We travel regularly to meet with our suppliers and enjoy the friendship and hospitality of the artisans who fashion these works of Indian art. 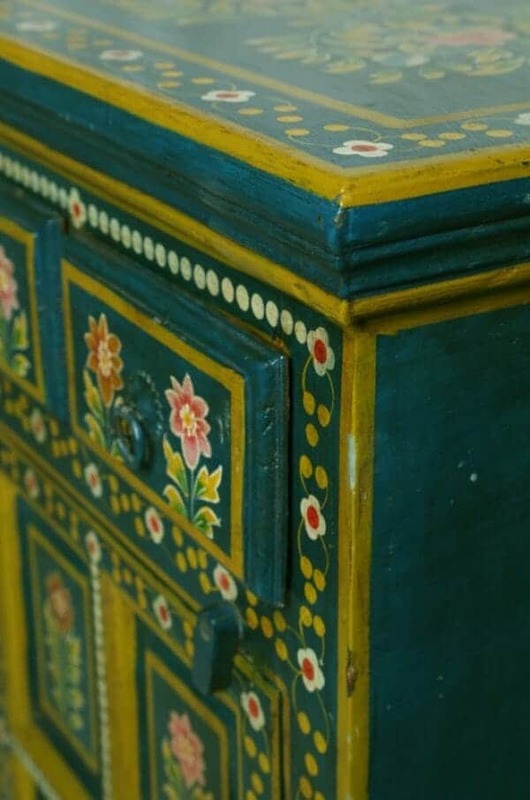 We see that all resources are sustainably and ethically sourced and that all trade agreements and working conditions are fair and equitable. 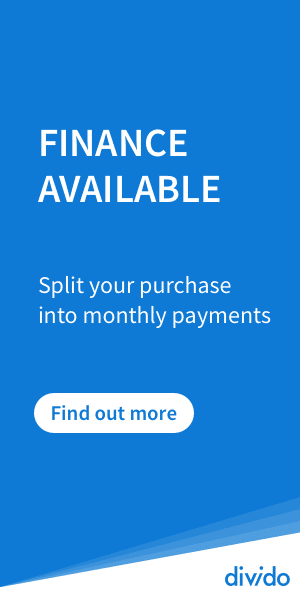 With over 20 years experience in our passion, we are able to communicate the needs of our customers accurately and confidently. 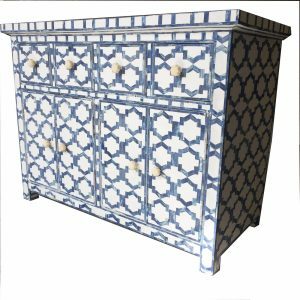 We can therefore, offer a luxury bespoke furniture service at no extra cost and would encourage you to consider your requirements: the measurements and the design, the colours and the patterns. 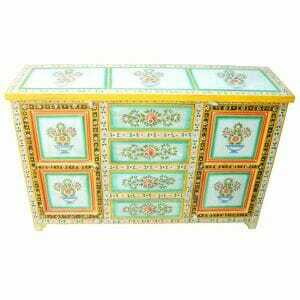 We can furnish you with a quote immediately and let you know the simple process for ordering bespoke furniture with us. 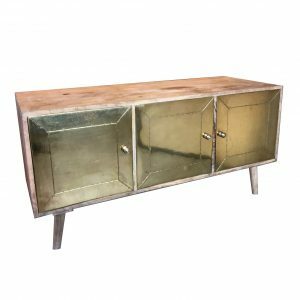 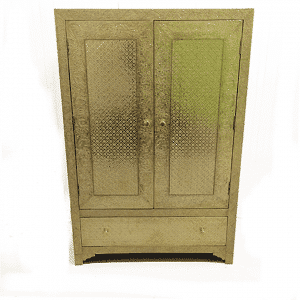 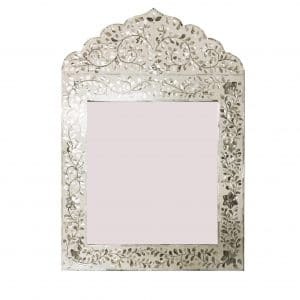 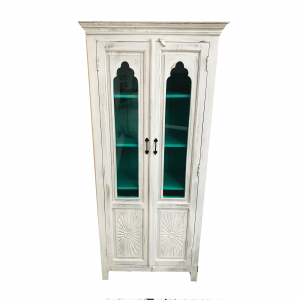 All our pieces can be made to order and are available in mother of pearl inlay, bone inlay, white metal, distressed paint, or in any of the styles you see on the painted Indian art furniture. 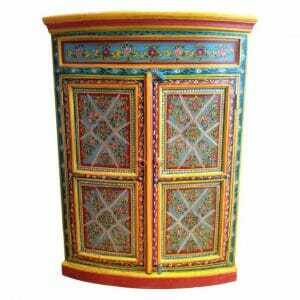 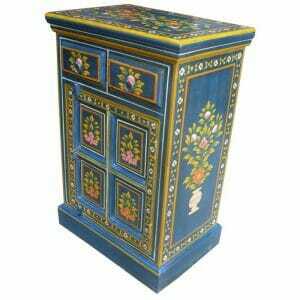 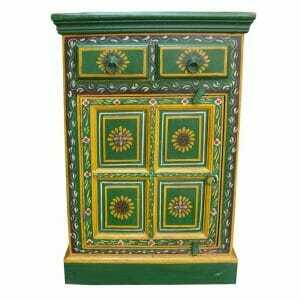 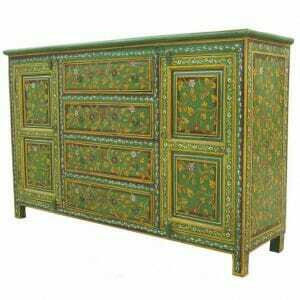 Indian painted furniture is remarkably easy to care for. 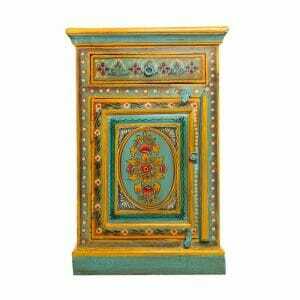 It is finished with a tough varnish that mutes bright colours, toning them down in versatile colour-ways that suit bold and neutral interior décor schemes. 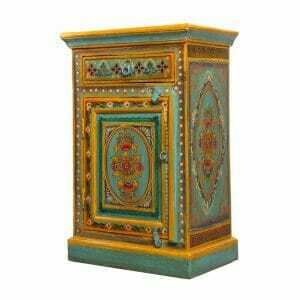 A regular dusting is generally sufficient but for any marks that require something more, warm soapy water is all that’s needed and a gentle wipe. 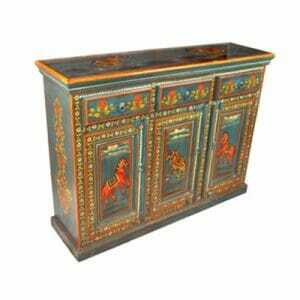 Avoid the use of harsh, corrosive chemicals.